Get ready New Zealand! 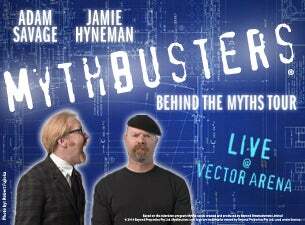 The all-new live show MythBusters: Behind the Myths, starring Jamie Hyneman and Adam Savage, co-hosts of the 5x Emmy-nominated Discovery series, will debut at Vector Arena this September. MythBusters: Behind the Myths presents a fantastical evening of on-stage experiments, audience participation, rocking video and behind-the-scenes stories. With this show, for the first time, fans join Jamie and Adam on stage and assist in their mind-blowing and mind-twisting approach to science. MythBusters: Behind the Myths brings you face-to-face with the curious world of Jamie and Adam as the duo matches wits on stage with each other and members of the audience. One of the most highly regarded and watched series on the Discovery Channel, MythBusters is now in its twelfth season. Co-hosted by Hyneman and Savage, the show mixes scientific method with gleeful curiosity and plain old- fashioned ingenuity to create its own signature style of explosive experimentation – and the supporting or de-bunking of urban myths that we live with day to day. Adam and Jamie have become spokespersons at large for applying science to real life – most recently as hosts of the Discovery Channel special iGenius: How Steve Jobs Changed the World, and have appeared on numerous shows including Late Show with David Letterman, Good Morning America, The Colbert Report and many more. They were invited to participate in Jon Stewart and Stephen Colbert’s Rally to Restore Fear And/Or Sanity and have received the Young Artist Award for inspiring young people in the interest of science. The MythBusters have been invited to participate on a panel at Comic-Con, where their appearances have sold-out four years running. Adam and Jamie produced and starred in an H1N1 Public Service Announcement for the White House, and were chosen by the President to retest the Archimedes legend using 500 schoolchildren as surrogate soldiers. They appeared as themselves in the movie Darwin Awards and have made several cameos on other TV shows, including CSI. And In 2010, Hyneman and Savage received the Outstanding Lifetime Achievement Award in Cultural Humanism from the Harvard Secular Society.